Click the drop-down arrow on the “Security” bar. Under “Firewall,” check to see if Windows Firewall is on. Under “Virus Protection” and “Spyware”, check to see if Windows Defender is on. If they’re not on, can you turn them on? 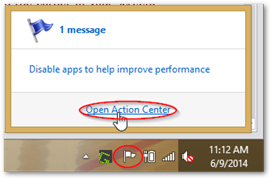 Go back to the Action Center and see if it will let you turn on Windows Defender again.